DIRECTIONS: This cemetery is located at the intersection of Route 11 and Route 122. It is approximately 300 feet from the road on a knoll. 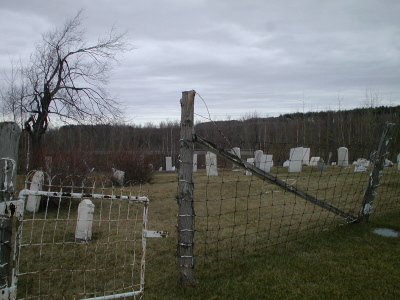 This cemetery is also known as Hawks Hollow Cemetery. This cemetery has been transcribed at least three separate times. The first transcription was compiled by Mrs. George Humphrey & Elizabeth Coleman, date unknown. Most of their work was conducted in the 1930s and 40s. Their work is available at the Saranac Lake Free Library in Saranac Lake, New York. The second transcription was conducted by H. McLellan on 9 May, 1953. Thanks to Wayne Miller, Librarian at Special Collections, SUNY Plattsburgh, Plattsburgh, New York for access to McLellans Cemetery Collection. In 1953, McLellan wrote, "Neglected. Barbed wire fence surrounding it. Most of stones fallen." Phyllis M. Thompson visited the cemetery on 10 August 1985. A third, independent transcription was compiled by Michael & Joyce Ranieri on 22 April 2001. Upon completion, this transcription was compared to the two earlier transcriptions for discrepancies. 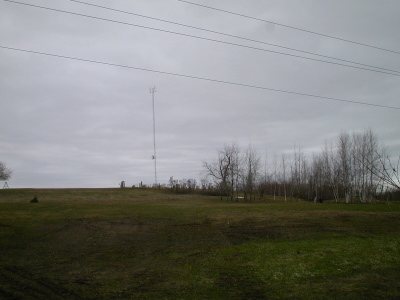 The cemetery is at the top of the hill near the pole. Elvira BARNUM Died 2 aug. (sic) 1855 Aged 20 Yrs. Our saddened hearts will cheer. Rhoda BARNUM died 14 Jan. 1855 Aged 25 Y'rs. Tis indeed a bitter cup. Marcus H. Died July 15, 1881 AE 58 yrs. Albert L. BARNUM Died Oct. 8, 1861 AE 22 y'rs. 1 mo. Rhoda Wife of Benjamin B. CHILDS Died Mar. 10, 1895 AE 73 Y'rs. Mariam Died May 22, 1848 Aged 13 y'rs. Mary Died July 21, 1851 Aged 17 y'rs. Hannah Wife of Peter B. DAVENPORT Died Aug. 12, 1853 In the 60th year of her age. William H. Son of J. & M. DAVENPORT Died June 13, 1881 AE 1 yr . 3 mos. 13 dys. Mary A. Daughter of J. & M. DAVENPORT Died Sept. 20, 1878 AE 4 mos. 22 ds. Made an angel of your child. Asa J. Son of Joseph L. & Charlotte GOODSPEED Died Feb. 2, 1864 AE 19 Y'rs. Florella daughter of J. L. & F. GOODSPEED died Feb. 19, 1841 AE 9 Yrs. Olive daughter of J. L. & F. GOODSPEED Died Nov. 10, 1848 Aged 2 (21??) yrs. 7 months & 5 dys. Flora GOODSPEED Died Nov. 2, 1880 In her 43rd year Gone but not forgotten. A. S. HOWARD Died July 29, 1872 AE 24 Y'rs. Elbridge G. HOWARD Died Apr. 5, 1875 AE 63 yrs 11 mos. Emery B. HOWARD 1846 - 1913 Co H 1st NY Light Art. Miner LEWIS Died Jan. 19, 1879 Aged 90 y'rs. 4 mo's. Eunice Wife of Miner LEWIS Died June 14, 1873 AE 84 Y'rs. L. N. MONTAGUE Died Apr. 3, 1855 AE 18 yrs & 5 mos. Simeon C. Son of Simeon & Phebe Ann MONTAGUE Died May 26, 1865 AE 11 yrs. 8 ms. & 15 ds. I am gone to the better land. Mariam Wife of Samuel ROBBLEE Died July 22, 1841 in the 62 year of her life It is done, the toilsomed toil is over. John TAYLOR Died Mar. 14, 1864 AE 73 y'rs & 3 mos. Jane M. Died Sept. 11, 1835 AE 3 yrs & 3 mos. Nellie L. Dau of Geo. W. & C. H. WINTERS died June 1, 1876 AE 7 weeks & 4 d's We miss thee at home.